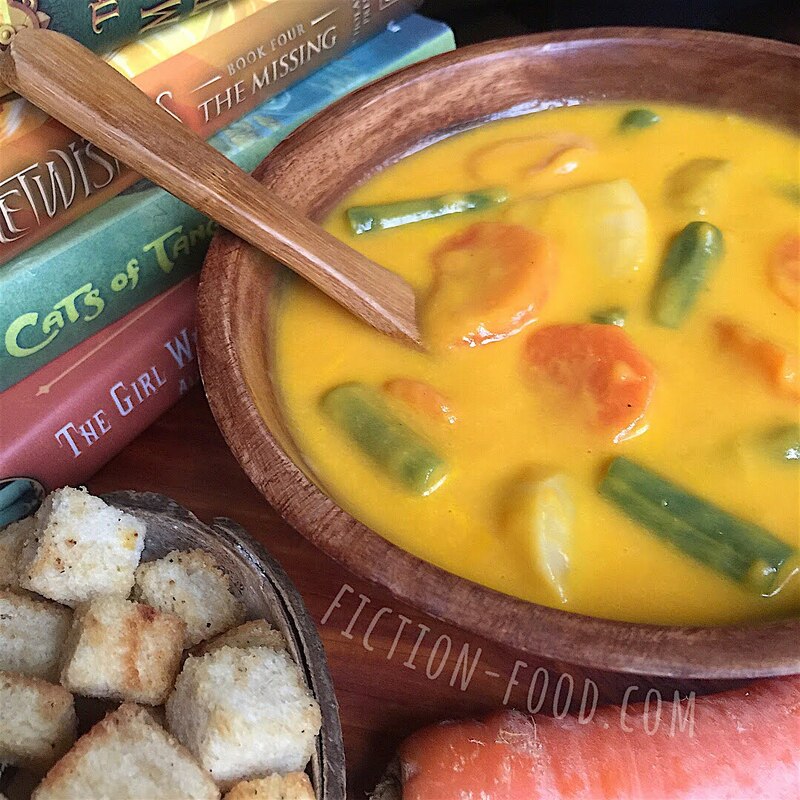 Do you know of other carrot soups or stews from fiction? I'd love to know! Note: This recipe has evolved into a hearty stew, but you can omit several of the ingredients to simplify it back to how it started. Celery, ginger, green beans w/ baking soda; all of these can be omitted, and the broth can be swapped out for straight up water if you like. 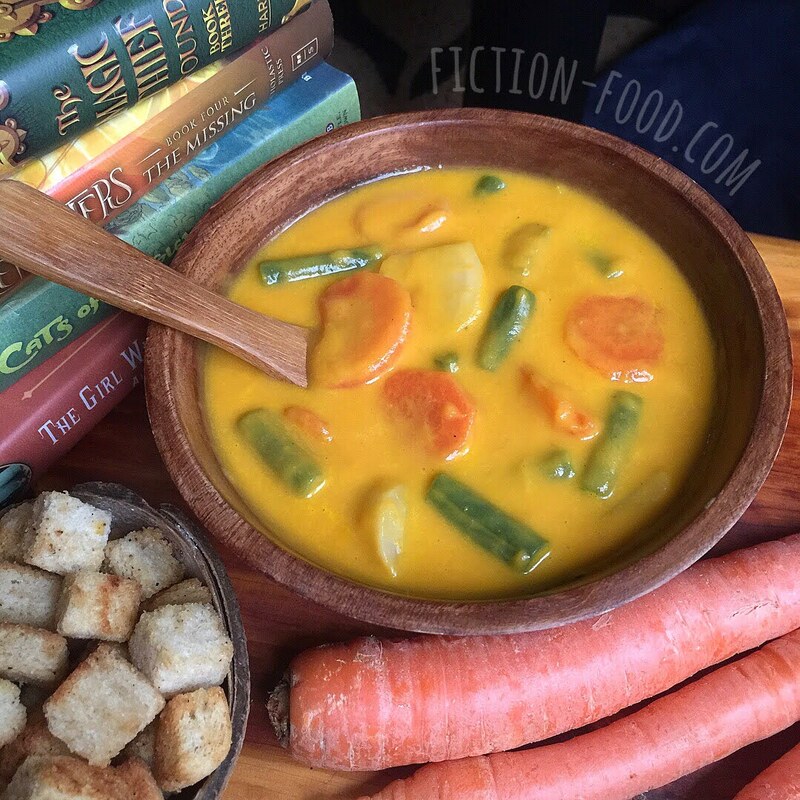 Of course this will change the flavors, but it's a versatile soup, so you can add spices that you like. You can even add milk or cream at the end if you'd like it more creamy and lighter in color. 1/2 Cup Green Beans/String Beans, ends removed & cut ~1" long. Melt the butter in a large pot & sauté the garlic & onions until tender. Stir in the ginger & cook a couple minutes longer. Stir in the carrots, parsnips, & celery, & then pour in the broth. Put the bay leaves on top & bring to a boil. Let boil for a couple of minutes, stirring, & then turn down to low to simmer, & cover. Cook for about 30 minutes or more, until the carrots are fork tender. In the meantime, put the cut green beans in a separate small pot & cover with water. Stir in the baking soda & bring to a boil. Cook until the beans are just tender & still bright green. Drain & set aside in a large bowl. Discard the bay leaves from the big pot. Using a slotted spoon, scoop out the parsnips, celery, & 1/3 or so of the carrots (how ever many carrot chunks you'd like floating around in your stew) & put them in the bowl with the beans. Blend the remaining broth & carrots chunks (& onions & garlic) either with an immersion blender in the pot, or in a standing blender in batches, making sure to hold a towel over the blender instead of putting the lid on (so steam can release). Add in a Tbsp. or so of olive oil while blending to help emulsify. 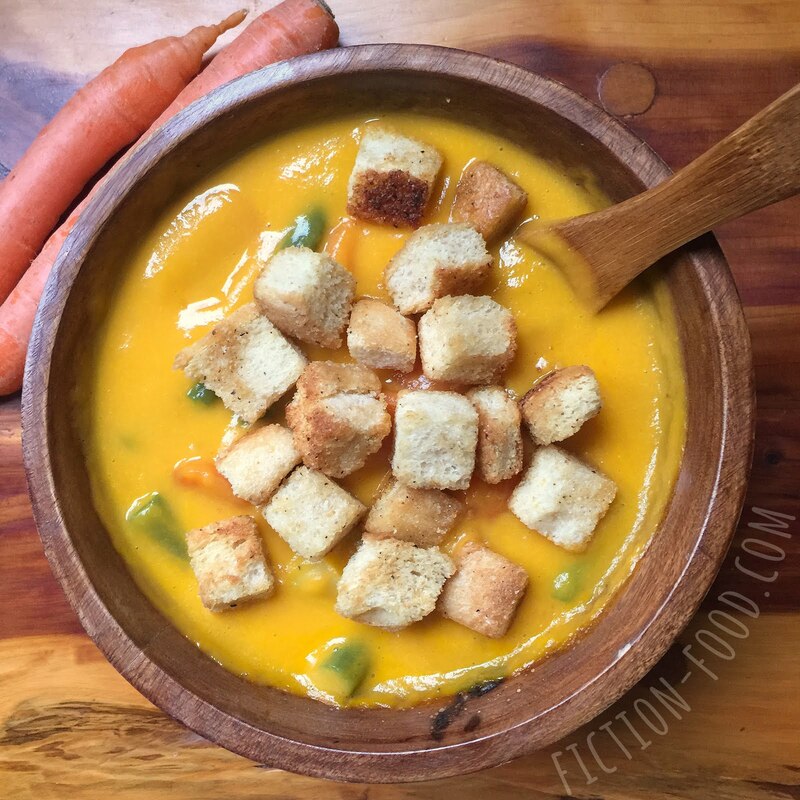 Blend for several minutes to make the soup smooth & creamy. Blend in salt & pepper to taste. *Note: Feel free to reserve some of the broth before blending (like, only blend 1/2 of the liquid) & then stir the blended mixture with the reserved liquid to make a thinner stew. You can also thin the stew out with more broth or water or milk (nut milk is fine). 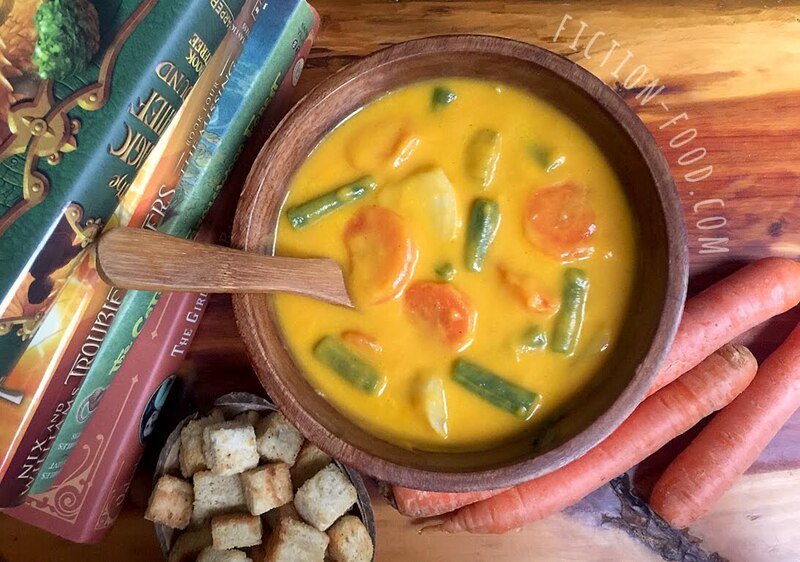 Pour the blended soup back into the pot or into a large pitcher, & stir in all of the vegetables. Now it's ready! Serve with rustic bread, or make your own croutons (how-to below). You can also garnish with fresh parsley or dill. Heat your oven to 325ºF. Smear a very little bit of olive oil onto a baking tray. Chop 3-4 slices of white bread (I like to use sourdough) into cubes the size you'd like to eat & place them in a large plastic ziplock baggie or a bowl with a lid (I prefer the latter). Pour 1 tsp. of olive per bread slice (so, 3-4 tsp.) over the bread cubes. Add in 2 tsp. or so (to taste) of a garlic-y seasoning (I like to use Famous Dave's) that has salt & dried herbs like parsley–whatever suits your tastes. Close the baggie or cover the bowl & shake & toss to coat the bread cubes very well. Spread the coated bread cubes out on the baking tray in a single layer & bake for about 10 minutes or so, until dry & crispy & golden. Serve on top of soup/stew, or in salads! Creamy Mushroom Soup from Gnomes/"The World of David the Gnome".